Chris Hooter is an operator in a man basket, pulling a lever to move an aerial lift up — way up — to 100 feet. He is a painter and is positioning to do a job on a high-rise office building. He manipulates the joystick on the platform control panel to move the lift to the right to get it better aligned. His centre of gravity is off for a second and the aerial lift tilts down ever so slightly. He re-adjusts and keeps moving up. The lift bounces a little bit as it gets into place. Finally, he has reached the top and can access his work area. But Hooter isn’t on a real aerial lift or at a real office building — he is completing all these tasks in virtual reality (VR). He is standing on a mock aerial lift motion platform and is wearing a virtual reality visor, which work together to make his task seem extremely realistic. Virtual reality is gaining traction as a training tool in occupational health and safety. The technology provides a virtual environment that causes the user to suspend disbelief and immerse themselves in a virtual world. It uses sight, sound and sometimes motion to provide a realistic experience. The appeal of virtual reality in the occupational health and safety space is that it provides a method of training workers on their actual job tasks in a safe environment. “You can do it in an office setting. You’re not outside on an oilsand site or potash mine with risk all around you. It’s all done virtually, so you can’t get hurt,” says Hooter. Over the years, safety professionals have dipped their toes in the virtual space with machines that simulate real work, such as Lincoln Electric’s virtual welding machine. Trainees don a headpiece and use a wand to mimic welding. The machine provides real-time technique feedback. Driving simulators are used for training in many industries. A wide range of simulators are available from those with a full-sized vehicle body to simple desktop simulators that use a computer monitor, steering wheel and pedals. But today’s virtual reality technology is quite different — it provides a completely immersive experience for the worker. Initially, this type of technology was met with hesitation among some health and safety professionals. About four years ago, the Northern Centre for Advanced Technology (NORCAT) in Sudbury, Ont. had met with safety professionals at mines in the area, but the response was that “safety is not a game.” After creating 3D tours of Vale and Glencore mines and hiring a highly skilled artist to create realistic animations, the health and safety representatives were on board. NORCAT has developed an induction training program where new contractors going to a site will experience a ride-along VR experience. The company goes to an employer’s work site and takes many photos and videos. It then inputs that information into various software tools to create a virtual world that resembles the company’s work site, including the characters and equipment. When the software is complete and workers put a virtual reality visor on, they are taken around a replicated version of their work site. “When they arrive on site, there are triggers they can recall: ‘Oh right, that’s the facility I saw on the ride-along’ and ‘Oh right, that avatar in the VR experience actually resembles my direct supervisor,’” says Don Duval, CEO of NORCAT. NORCAT also has a robust virtual reality mine rescue program that is a multi-player, team based environment. Users can be anywhere in the world but they complete the training virtually with their team, collaborating and relying on each other. They simply don their virtual reality goggles and enter a virtual mine site where they complete a rescue with their teammates. All the appropriate engineering specifications and timelines are a part of the virtual reality rescue. Oxygen is continuing to deplete underground and participants must retrieve extinguishers, navigate smoke, communicate with surface operations and much more, says Duval. The training Hooter and his IUPAT members are completing is by Serious Labs in Edmonton. The aerial work platform is the company’s flagship virtual reality training program for heavy industry. It can be used to train anyone who has to perform a task at height while using a mobile elevated work platform, such as sheet metal workers, plumbers and electricians. Serious Labs has just rolled out its scissor lift version of the aerial work platform simulator and it’s building four other simulators for forklifts and earth moving equipment, says Colvin. The company also has a crane virtual reality simulator that can test the user in about 400 different scenarios, including complicated lifts and lifts under challenging conditions. Serious Labs has also built a snubbing virtual reality simulator for the oil and gas industry. It replicates a snubbing jack, which is something that is put over a well head when there is underbalanced pressure, and trains workers in this very dangerous, very specific task, says Colvin. There is also the option to work with a service provider on fully customized training. For example, a large petrochemical company was having difficulty with a complicated lockout/tagout procedure, so it approached Serious Labs. The particular process is very hard to train on and all of the company’s contractors need to be ticketed on it, Colvin says. The company is developing a mobile app so the petrochemical company’s workers can drop their smartphones into devices such as Google Cardboard or Samsung’s Gear VR — which turn smartphones into virtual reality viewers — to receive the training. Augmented reality — when digital images are superimposed into a user’s view of the real world — is also gaining traction in the safety training space. NORCAT has developed a fire extinguisher augmented reality program where individuals use an actual fire extinguisher with an augmented reality screen attached to it. The user can choose an item in his workplace and “set it on fire” — or so it would appear on the screen. The user then physically has to pull the pin, aim, squeeze and sweep. “(It will) determine are you holding the extinguisher at the right angle? Are you sweeping at the right pace? And the fire continues to grow and evolve like it would in a real situation, but you are also physically holding the extinguisher to have that real experience because some of these extinguishers are quite heavy,” Duval says. Undoubtedly the greatest appeal of virtual reality safety training is the fact that workers can be exposed to very high-risk situations in a 100 per cent safe environment. They can be trained for incidents that they could never be trained on in a classroom or even mock training facility, says Colvin. Knowledge retention is very high with virtual reality programs. Even after they have completed a virtual reality training program, individuals are often talking about it with their colleagues or noticing things in the real world that are the same as the virtual world, which increases recall, says Duval. Virtual reality provides a good method for assessing workers’ skills and abilities before they’re on the job site. An employer might want its more experienced workers participating in virtual reality training as well because it can provide an accurate snapshot of their skills. It will prove if they do, in fact, work safely or if they cut corners, Colvin says. At a recent trade show, a very experienced tradesman tried Serious Lab’s aerial work platform VR simulator and he got a very low score. “He was very aggressive, he was hard on the controls, he was very jerky and abrupt, his ride quality was terrible, his feathering of controls terrible. All of the things that not only can lead to injury but can also be really hard on the equipment,” Colvin says. Aside from the safety benefits, virtual reality training can result in less damage to rental equipment, which translates into less downtime, he adds. The cost to train your workforce in virtual reality varies considerably and depends on what option you ultimately choose. The motion platform from Serious Labs cost US$70,000, Hooter says. Then, a monthly subscription fee is paid for the training software to ensure it’s always up to date. If you’re looking for a more basic VR training experience using just the headsets, Winnipeg’s Bit Space Development works with companies to build applications for safety training. Its services start at $5,000 per year for two course modules and the training is compatible with a wide range of headsets in various price points. VR headsets can be purchased at retail shops or online for anywhere from $15 for the Google Cardboard to $700 for the HTC Vive. Keep in mind that not all virtual reality training is compatible with products that use smartphones in the VR headset, so make sure to check with the developer and find out what hardware they support. Holobuilder.com offers a complete do-it-yourself solution. Targeted to construction companies, the safety manager uses an app on her phone to record her own work site in 360 degrees. She walks around the site, making sure to consider every blind spot. Then, she uses the online web editor to enrich the job walks with warning signs, floating text, safety rules and integrated videos. Workers can access the virtual site using their smartphones and Google Cardboard. Holobuilder is offered on an annual subscription basis, starting at US$900. Another option is for employers to use a third-party training provider to train their workers. United Rentals has partnered with Serious Labs to pilot this model, which would be significantly less costly to employers than purchasing the equipment themselves. “They can take the online course for the theoretical part at home, go down and take the simulator part right at the branch and get assessed and be on the job site by lunchtime,” says Colvin. Yet another option is to rent the VR equipment, which could include motion platforms and headsets, when you need it. The rentals could come with or without the training software, depending on the circumstance. This is going to be a very common method going forward, says Colvin. An online company aptly called VirtualRealityRental.co has many different types of VR equipment for rent. COS asked how much it would cost to rent 15 VR headsets for one day, and the price tag came in at US$3,450. In Canada, the company serves Calgary, Edmonton, Montreal, Ottawa, Quebec City, Toronto, Vancouver, Victoria and Winnipeg. Another decision to be made is custom versus generic training. 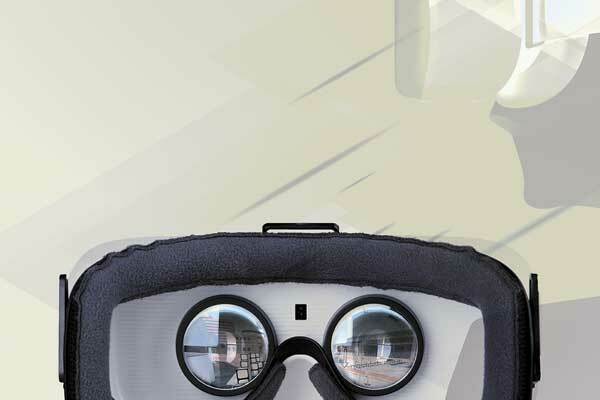 Immersive Technologies’ WorksiteVR Simulator provides training for construction equipment. Starting at US$30,000, employers receive all training materials, software and hardware, including VR display and headwear, a high-end computer, pedals and the specific hardware for the type of simulator they choose, such as joysticks for the excavator and steering wheel and bucket control levers for the wheel loader. The company has offices in Fort McMurray, Alta., Ottawa and Vancouver. There are also generic mobile apps available for smartphones, accessible with products that convert the phone into a virtual reality viewer. Texas Mutual Insurance company’s virtual reality safety training app, called Safety in a Box, allows users to experience the dangers of workplace accidents with 360-degree perspective video. In one video, the user is working at height and sees what it would be like if he got too close to the edge. But Duval cautions that generic solutions may not be sufficient for most companies. Virtual reality training won’t be for everyone. While the technology companies are working hard to eliminate the side effects, there have been reports of people feeling nauseous after using virtual reality headsets. “We have worked with a variety of different companies where some (workers) don’t enjoy the experience for a variety of reasons and you need to know that,” says Duval. For this reason, companies need to have alternate training methods available. If an individual does not like the VR experience, similar training could be available with an avatar on a computer, Duval suggests. Another challenge is that there’s always going to be late adopters, says Colvin. In general, younger workers are more open to virtual reality technology and expect their employers to use the most cutting-edge technology, while older workers may be more hesitant. But once they start using it, they love it, Colvin assures. For now, virtual reality safety training is mostly seen at companies that complete high-risk activities, such as those in construction, mining, oil and gas and forestry. But soon it will be common in all industries, Colvin believes.